Upon first entering the demo, you are tasked with investigating the scene of a crime. 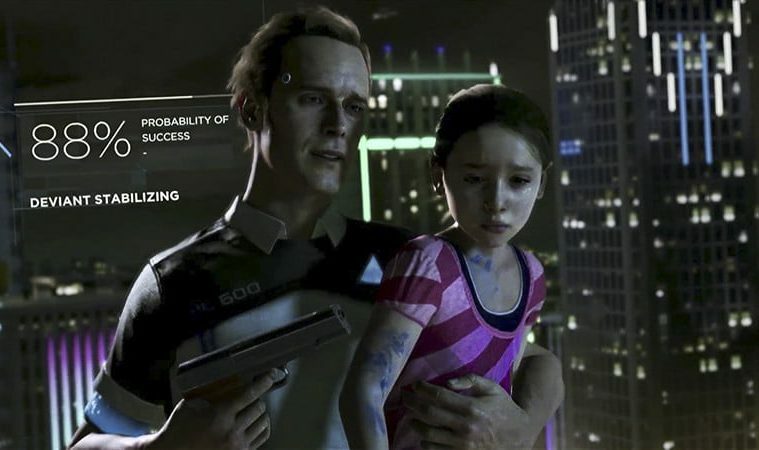 Quantic Dream games have done this before, but the difference this time is the ‘situation’ is still taking place. The player character’s main directive is not as a detective but a hostage negotiator. So any investigation done is to try and increase odds of success regarding the imminent conversation with the suspect. This makes the investigating a little more dire and a little more interesting (in theory). And I think that’s fairly cool. Rather than letting this sensible mental order rest in the background of the player experience, Detroit literally writes it out on screen. Upon finding an optional investigation, it displays text saying “you’ve unlocked dialogue options, usually beneficial“. So we have absolutely no doubt about the way this gameplay is going to function… Right or wrong as that may be, it’s still not where my big gripe is at. Once all investigation is complete and the conversation with the suspect is under way, all unlocked dialogue options appear in the context menu with a little unlocked symbol right next to them. And since you’ve just seen the text pop up on screen telling you that these dialogue options are usually beneficial, the logical response is to make sure you’ve hit those unlocked dialogue options, because it will probably be a benefit! Makes sense right? Obviously. So you hit those super special dialogue options, and watch the situation resolve itself on screen. Mission compete. In order to create a compelling choice-driven game, there has to be pressure of failure. That pressure not only makes us pay attention to everything closer than we might have otherwise, but it also encourages us to dig deeper just in case there’s something more to find that could help us. With everything spelled out in the way it is in Detroit, that pressure is totally dissolved. Yes, there is still some imagination of pressure because the suspect is holding a child on a rooftop threatening to jump. But if you don’t worry about that, and just focus on connecting the dots and doing what the game wants you to, there’s no way to fail. What that ultimately leads to is feeling like the game is playing itself, and the only thing left to really enjoy is the sensory experience and the graphics. This could so easily have been avoided. All they’d have to do is remove all these extra graphics and hint systems: the glowing objects in the focus view, the display of total number of discoveries per investigation, the unlock symbol next to dialogue options, the “usually beneficial” text… They probably wouldn’t have to re-write anything; the dialogue structure would stay the same, the only difference being that unlocking those more successful dialogue options would come about much more organically — as a product of truly digesting the story and its characters. This system of doing extra work to reap extra reward could all stay the same. But let it exist in the head of the player rather than defined on screen. It’s interesting that I didn’t feel anything similar to this in other Quantic Dream titles. I guess because those ones didn’t have all that unnecessary stuff I mentioned. It is possible the team made a conscious choice to make that change to relate more specifically to the “android” main characters — assuming this computer software would make their decision-making more robotic. But if that were the case, I would argue that as authentic as it may be, nobody wants to play that game, because it translates to a very dull experience. It’s also possible that not the whole game is like this. Perhaps decisions in later scenarios become much more shady and compelling. But if that were the case, I would argue, why pick this scene to speak for your game?? What it seems to promise about the gameplay of the full game is very discouraging. If any readers have any thoughts on the subject, please comment. I want to hear what you think.